Ladybirds Song Group CD now available!! 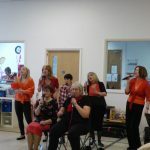 By popular demand The Ladybirds Song Group have made a CD and we are thrilled to be selling this in our charity shops!! The CD contains all the favourite songs we have come to love hearing The Ladybirds sing when they perform at Hamelin Trust. The CDs are available now in The Hub in Billericay and The Shenfield Shop. The CD costs £8 and The Ladybirds are very generously donating 50% from the sale of the CDs to Hamelin Trust!! They would make great stocking fillers! If you would like a copy of the CD, but can’t get to the shop contact us on 01277 653889 or enquiries@hamelintrust.org.uk and we can arrange to get a CD to you. We want to say a massive thank you to The Ladybirds for all their support and for very generously donating 50% of their profits to us and wish them well in this exciting venture – Thank you!!! !